Based on my research, it looks like the error results from something missing in a routine. I have limited access to this system. 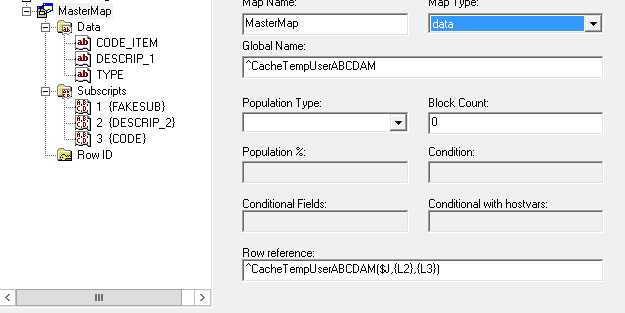 I am able to open up the corresponding Class in Cache Management Studio and edit/compile the code there. However, I do not have access to the "Routes" section of the Management Web Portal. When I run the SQL Query in the Management Web Portal, I get the same error listed above, and only the column headers show up, no rows are populated. Based on my limited analysis of the Class file, I think the issue is somewhere inside the SQLMap. It looks like there is use of Subscripts that are pretty complex. I'm wondering if there's something wrong in there? Is there anything I can do with the class code in Studio to debug or get more info about this error? Perhaps there's a faulty cached query. The 2012.1 docs here describe how to use Portal to see what's in the cache, and how to purge items from it. Thank you for the reply, I appreciate the help! I found the query in the cache and purged it. Unfortunately, when I ran it again, I encountered the same error and it recreated the query in the cache, but with today's date as the creation date obviously. If you can't find routines check that system saves sources for cached queries. If it doesn't set the setting to save routines, purge this query and run it again. After that you should be able to see the source. Also can you determine which part of SQL causes this error?